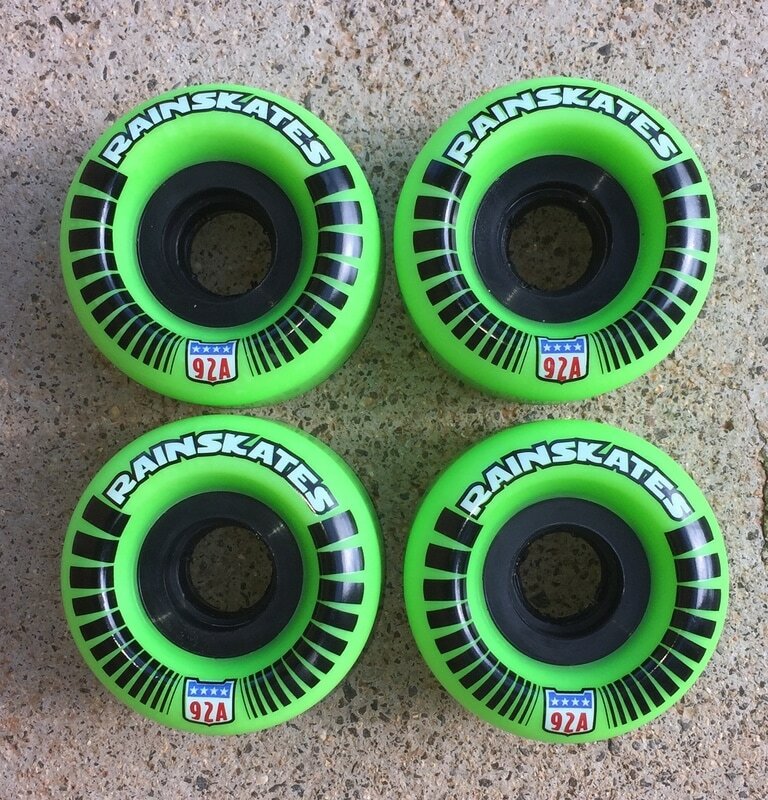 Rainskates makes some of the best and most unique wheels today. 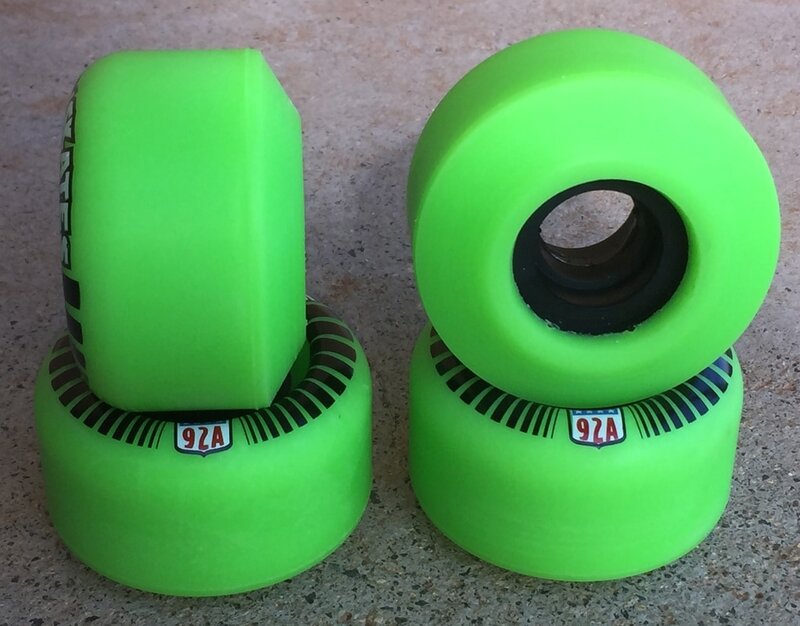 These 92A 62mm lime green Kaku wheels are their latest and long awaited. Pete was kind enough to send us a set to take for a test spin.The hardness is perfect for ditches, parks, pools and pretty much anywhere. They ride smooth yet solid enough not to mush out. Plenty fast with the core and the slide is just right. 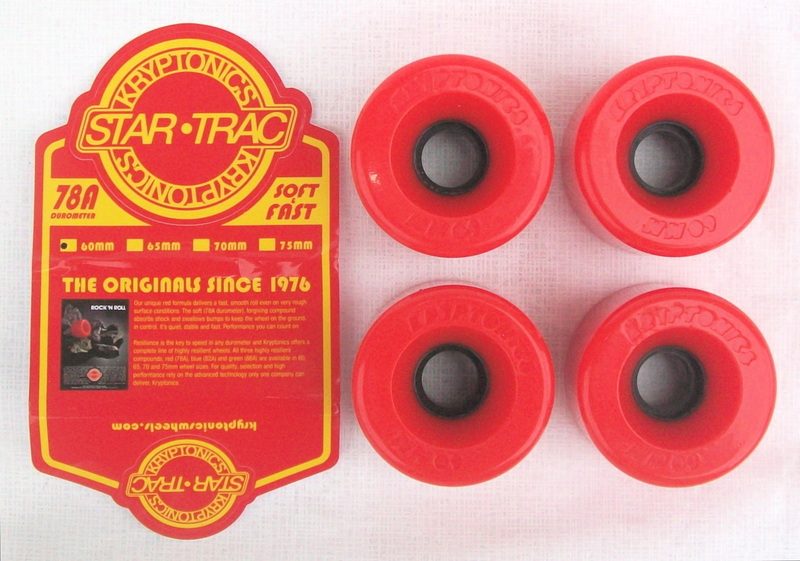 On concrete they break free with a moderate amount of force and squeal like the old Speed Wheels of the 80’s providing a controlled and easily predictable slide. 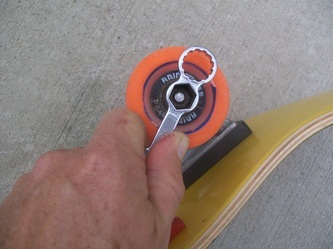 On skatelite ramps they keep good speed and tend to stick a little more than the harder wheels. These come with a side cut on the back like the old Bullet wheels which provide control on lip tricks while still releasing good for re-entry. Rainstates wheels also last longer. These are the best all terrain wheel we’ve tried making them an excellent choice for people that don’t want to change wheels everytime they change surfaces. Since I needed to grip my OFCS board for the review I contacted the uys at Flik griptape and they sent a pool board size sheet. 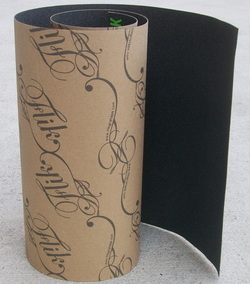 It was easy to cut a design in - I'm old school, and easy to apply. Not to stiff, good thickness and as smooth as grip can be to trim. The grip has great traction, not to harsh and allows for foot shifting when needed. Flik comes in a cool variety of colors and graphics in the standard size as well. Next time you need grip ask for it at your local shop. Jake and the crew at Tracker sent us over some of the new Bill Danforth version of the Dart for pool boards and a pack of hardware. Right out of the box the quality was apparent. Hangers nicely lined up over the base and all finishing work very clean and precise. 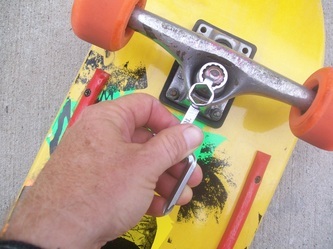 We mounted these to an American Nomad deck and took them for a spin. They handle stable, precise and turn fast too. Quality you could feel under your feet. Tracker has always been known for their dependability and durability under abuse and this Danforth model affirms that commitment. They've been producing quality trucks since the Dogtown days( just pick up an old skateboarder or look at vintage photos online) and grew throughout the 80's with legends like Jeff Phillips, John Gibson, Todd Prince, Dan Wilkes, Mike McGill, Tony Hawk, Kevin Staab, Tom Groholski, Bill Danforth and so many more. Today they continue the excellence with new rippers like Sky Siljeg, Adam Taylor, Patick Melcher plus Dogtown legend Jay Adams and of course Danforth. 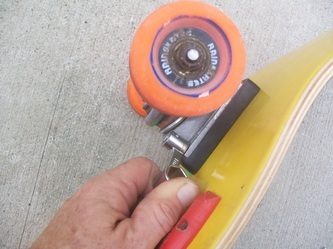 Whether you skate pools, parks, curbs, streets or ramps these will handle it with ease. We highly recommend giving these a try along with a solid set of Tracker hardware to hold them on for all the punishment you dish out. Dan over at Mentality sent us some of his cool Thin Dot Home button Stickers for iPhone, iPad and iPod touch to check out. We stuck them to an open phone and also one with a rubber cover and they look nice. They work well too. It says they can be repositioned and leave no residue, so we did just that. They work great. Nice, great looking, simple, fun product to liven up and add some skate style to your iPhone, Ipad or iPod touch. Michael grew up in the thick of LA punk rock, created fliers, was in a few bands and writes for Strange Reaction, Flipside 2010 and has interviewed many legends. This is his book about growing up in those times and onward to more recent. Last One To Die is an entertaining and informative look into what it was like to grow up in The LA area of California in the 70's, 80's, 90's to now as a dedicated punk rocker, student. employee, skater, band member, rapper, dad and fighter. It's all in here - struggles, moments of brilliance, dysfunctional families/people, relationships, told in various stories that vary in time period as though you were being told in person. The perspective is great for those of us that have no idea what life was like then and now in that part of CA; something I'd always wished I had done. 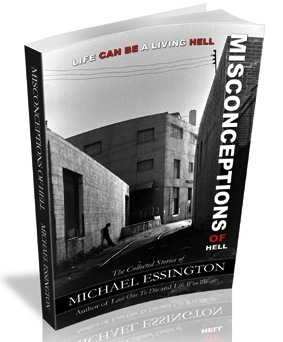 Some of my favorite stories were Ray and his crazy wife, the 20 mph mudslide to a luckily red lighted street, El Lobo and the knife and razorblade with cops moment...ok, I'm teasing you...because I want you to read this book. There's way more, but I don't like to do long drawn out reviews; rather short and to the point (like a good punk song)... Towards the end are some great interviews Skateboard legend and punk rocker Jay Adams (I've viewed many Jay interviews and this one stands out) , Eric Leach of Symbol Six, Lisa from Frontier Records and the incredibly innovative and talented musician; Rikk Agnew. I must admit when I first started reading the book it wasn't what I expected, and it turned out to be so much more. It was an honest accounting through the stories of one who lived it with no glam, no self pity through one of the most interesting time periods in music and Skate history that keeps you going page to page til you've stayed up too late or blown off other responsibilities - so grab this book and experience it for yourself.